Oil on canvas. Signed, titled dated on verso. Framed. 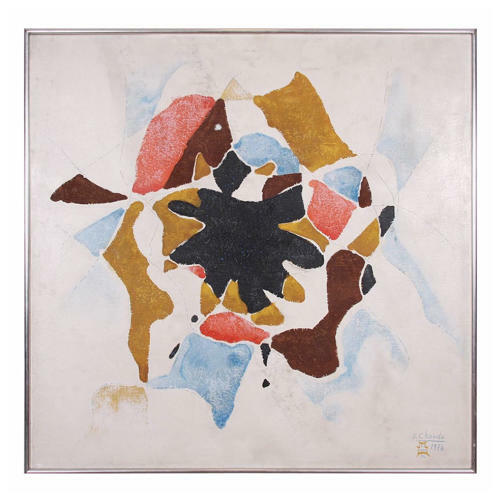 Born in 1914 in Navsari Gujarat, Chavda joined the Sir J.J. School of Art, Mumbai in 1930. In 1935 he went to London where he studied at the Slade School under Professor Randolph. In 1937, he continued his studies at the Academie de la Grande Chaumiere, Paris. While in Paris, he worked alongside Leon Bakst and Picasso in designing the sets for the Diaghelev Ballet. He travelled extensively through the length and breadth of India to understand his subjects. Indian temples, the ancient art traditions, rural life, the sacredness of art, all formed the basis for his unique style. Chavda's style evolved from the early realistic portrayals to depiction of the personality and character of his subjects but the works always remained optimistic and vibrant, though never dramatic. Shiavax Chavda was a masterful interpreter of ancient Indian art forms and his sympathy with its subjects, whether human, animal or architectural and his ability to enter their souls with a few deft strokes is considered the hallmark of his work. His ability to capture the life force, the movements, even their muscular structure or their body structures with a few simplified strokes is what makes him stand apart. He had his first solo exhibition in Mumbai in 1945 and thereafter in Indonesia, Singapore, London, Paris and Switzerland. His works have also been featured in the UNESCO International exhibition (1946) and the Salon de Mai (1951). Between 1956-63, he exhibited with the Bombay Group. A retrospective of his work was held at the Jehangir Art Gallery in 1993. Shiavax Chavda died in 1990.